In the bowl of a stand mixer fitted with the dough hook, stir together warm water, yeast, and sugar. Let stand until creamy, about 5 minutes. To the yeast mixture, add the butter, salt, and 2 cups of the flour. Mix on low-speed until the ingredients begin to come together. Still on low-speed, add 1 cup of the remaining flour and mix for 1 minute. Add the remaining 1 cup flour. Mix on low-speed until the final addition of flour is fully incorporated into the dough. Increase the speed to medium and knead until the dough is smooth and elastic, about 5 minutes. (You will know it is ready when the dough starts to make a slapping sound as it hits the sides of the bowl.) Remove the bowl from the mixer and cover it with a dish towel. Let the dough rise in a warm place until doubled in volume, about 20 minutes. Turn the dough out onto a lightly floured surface and form it into an even ball. Using a serrated knife, cut the dough in half vertically, then each half vertically again into thirds so you have 6 equal strips of dough. Cut each strip of dough into fourths by cutting horizontally to make 24 little squares of dough. With lightly floured hands, roll each piece of dough into a ball. Place each rolled piece of dough into a lightly greased 9×13 baking pan in rows of 4. Cover the rolls with a dish towel and let them rise while your oven is preheating to 400 degrees F (200 degrees C) – about 20 minutes. Lightly brush the rolls with about half of the melted butter before baking. Bake until golden brown, 13-15 minutes. 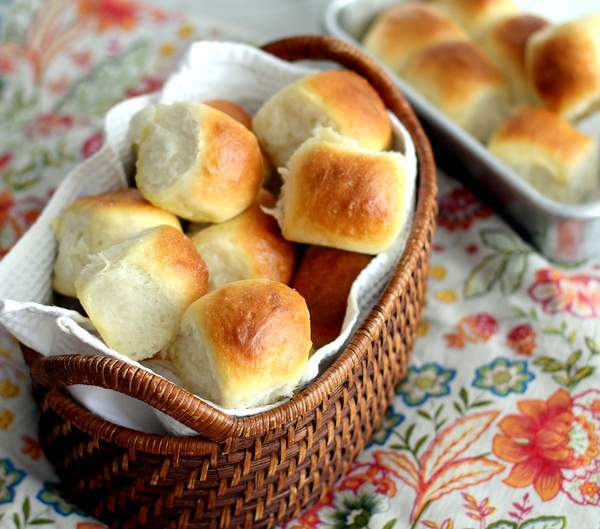 Immediately after removing the rolls from the oven, brush them with the remaining melted butter and sprinkle with salt. Flip the pan over to remove the rolls. Serve immediately. Recipe formatted with the Cook'n Recipe Computer Software from DVO Enterprises.